The Zino brand was established back in 2003 and was targeted to offer high-quality premium cigars to a younger, more contemporary audience. Over the past few years, the brand has become one of the dormant ones in the Davidoff portfolio. (During the past five years, Davidoff has focused on building its Black Label Discovery Series as well as the rebranding of the Camacho, AVO, Winston Churchill, and Cusano brands.) 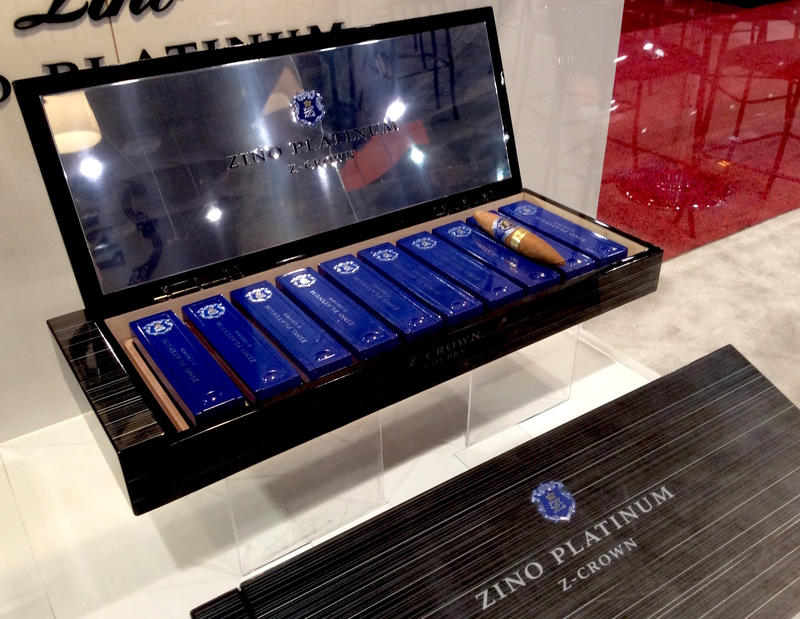 At the 2017 IPCPR Trade Show, Davidoff showcased a new two cigar ultra-premium line under its Zino brand known as the Zino Platinum Z-Crown. 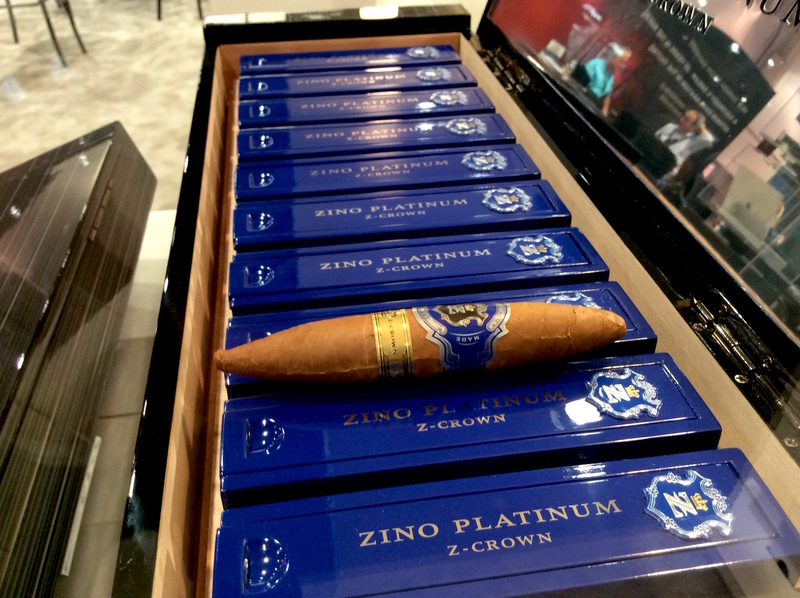 The Zino Platinum Z-Crown line contains two distinct blends each in a single size: the Zino Platinum Z-Crown Chubby (a perfecto) and the Zino Platinum Z-Crown Stout (a Torpedo Largo). With the blends, Davidoff presents its two most ultra-premium releases to date, with the Chubby having an SRP at $75.00 and the Stout coming in at $100.00. Today we take a closer look at the Zino Platinum Z-Crown Chubby. There are a couple of factors that play into why the Zino Platinum Z-Crown series is priced very high. First up is the packaging – each cigar is packaged in an exquisite blue glossy coffin. The coffins are packaged in very elegant contemporary ten count boxes featuring a mirror on the inside of the box. These ten-count boxes mean the box of the Chubby will go for $750.00 and a box of the Stout will go for $1000.00. Secondly, the tobaccos and the cigars are well aged. Each of the blends contains fillers that were aged for eight years. After the Zino Platinum Z-Crown cigars are rolled, they were set down for another four years. Production of the cigars is limited, as only 1,000 ten count boxes of each size has been released. As noted above, Zino has been somewhat a dormant brand. The last national release of the Zino line was 2014’s Zino Platinum Make of Texas line, the third installment of the limited edition “Make” series. As for a regular production release, you have to go back to 2011 when Zino released the Zino Platinum Z-Class Series. Without further ado, let’s break down the Zino Platinum Z-Crown Chubby and see what this cigar brings to the table. 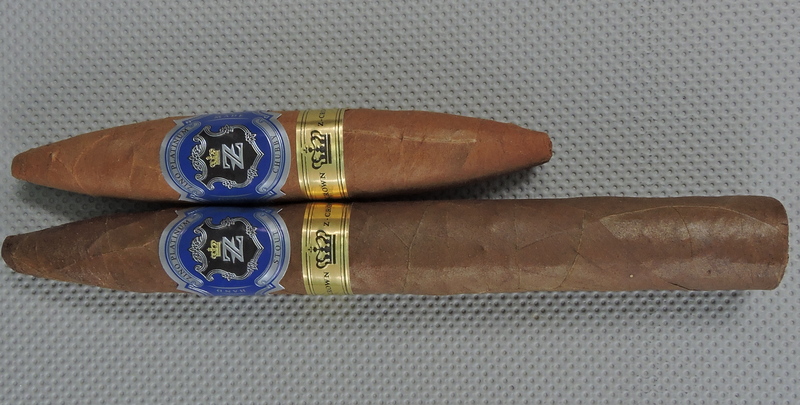 For completeness, we list both blends of the Zino Platinum Z-Crown Series. Each of the blends utilizes Dominican grown wrappers that feature proprietary Davidoff tobaccos. The Chubby uses a Semila 253 wrapper from the Yamasá region while the Stout utilizes a Semila 702 wrapper. The Semilla 253 wrapper of the Zino Platinum Z-Crown Chubby had a light brown color. While it was slightly weathered, it still had some golden brown qualities. This was a slightly rugged looking wrapper that had some visible veins and there were some visible wrapper seams. The perfecto was nearly tapered to a tip at the head of the cigar. There is a similar tapering near the foot – although it does feature a slight open footer. There are two bands on the Zino Platinum Z-Crown Chubby. The primary band features a black, silver, and blue color scheme. There is a silver “Z” prominently in the center of a black shield with a gold crown above it. The shield itself has a silver trim around it. The shield sits on a blue background with silver adornments. Above the shield is the text “ZINO PLATINUM” in blue font sitting on a silver background. Below the shield is the text “CHUBBY” – also in blue font sitting on a silver background. The right and left sides of the shield have the text “HAND” and “MADE” respectively – each in silver font on a blue background. The secondary band has a gold foil color with black pinstripes near the edge. The center of the band contains a black crown. To the left and right of the crown is the text “Z-CROWN” – also in black font. Before commencing the smoking experience of my Zino Platinum Z-Crown Chubby, I used my Credo Special T cutter with the 36 ring gauge hole to get an ideal cut. This allowed me to get a smaller ring gauge cut and to take advantage of the tapering near the tip. After clipping the tip, I moved on to the pre-light draw. The dry draw was quite unique as I got notes of cedar, generic wood, butter, and a slight dark fruit note. I was quite impressed with the pre-light draw of this cigar. At this point, I was ready to light up the Zino Platinum Z-Crown Chubby and see what the smoking stage would have in store. 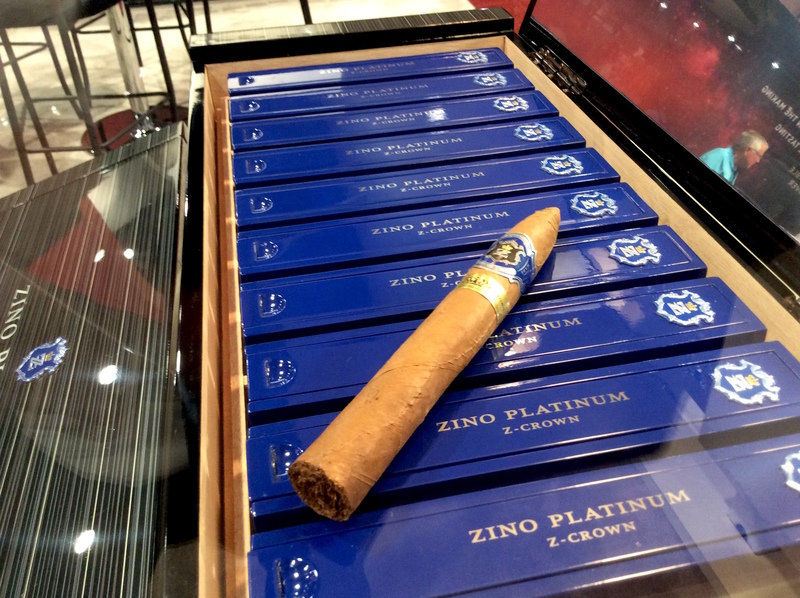 The Zino Platinum Z-Crown Chubby started out with notes of white pepper, cedar, and fruit. The spices quickly subsided, giving way to notes of dark fruit, buttery cream, and classic wood notes. As the cigar burned through the tapered area, the flavor profile took form. I found the buttery cream and classic wood notes became primary. The cedar (yes there was both a classic wood and cedar component on this cigar) settled into the background and developed a slight floral component. The dark fruit notes floated between the forefront and background. Meanwhile, there was a combination of wood notes and a slight fruit sweetness on the retro-hale. The second third saw a fusion develop between the buttery cream and the wood notes. There was a touch of sweetness that was mixed in and that fusion resulted in a very nice and unique flavor. This fusion was complemented by the fruit and cedar/floral notes in the background. During this stage, the retro-hale morphed into a more classic cedar note. Later in the second third, the cedar notes increased. By the final third, the cedar displaced the wood/buttery cream notes in the forefront. During this stage, the buttery cream component slowly dissipated. There still was a touch of cedar and dark fruit. There also was a return of some white pepper. This was the way the cigar experience of the Zino Platinum Z-Crown Chubby came to a close. The resulting nub was firm to the touch and cool in temperature. The burn of the Zino Platinum Z-Crown Chubby performed extremely well – as good as I have had on any perfecto. This cigar didn’t require much maintenance to maintain a straight burn line and straight burn path. The resulting ash was silver-gray with some dark spots. This was a firm ash that came off the cigar in clean chunks. As for the burn rate and burn temperature, both were ideal. The draw to the Zino Platinum Z-Crown Chubby also performed quite well. It had a touch of resistance – which is something that I like. The area where I clipped the tip never got soft. There also was an abundance of smoke released from the Z-Crown Chubby. The Zino Platinum Z-Crown Chubby is not going to be a cigar that overpowers with nicotine. This is a cigar that started out mild to medium in strength. The strength increased during the second third and progressed into the medium range just past the midway point. As for the flavors, they started out medium-bodied. There was a slight increase in intensity along the way, but in the end, the Z-Crown Chubby remained in the medium body range of the spectrum. It’s obvious that the higher the price of a cigar, the question of value becomes bigger and bigger. While it’s not Davidoff Oro Blanco priced, the Zino Platinum Z-Crown is still quite expensive. At $75.00, the Chubby doesn’t provide a lot of cigar for that price. What I can say is that on merit alone, this is a cigar that delivered well. The second third of this perfecto was as good a Davidoff cigar as I have – and it’s also a cigar that packs a nice amount of complexity in a small package. However, as I’ve said many times – it’s really hard to justify recommending a person to buy a cigar priced at $75.00. The best way I can sum up the Zino Platinum Z-Crown Chubby is that it’s a cigar good enough for those who want to splurge – much like one may splurge for Dom Perignon champagne. It’s a cigar that I would recommend to any cigar enthusiast for a special occasion – and in that case, it’s one worth picking up.